Information on Bear Attack shop in Kronshagen near Kiel, Germany. Information on Bear Attack shop in Concord, CA, USA. When you are in the San Francisco area, please come visit our shop which is located on the East Bay in Concord. We are in 2490 Arnold Industrial Way, Suite K, Concord CA 94520-5373, USA. To avoid disappointment give us a call before you plan to visit us and ask for the shop opening times. We are reachable under 925-922-0592. Coming by BART? Give us a call and we pick you up from the North Concord - Martinez Bart station. More information can be found on the shop dedicated web page which can be selected on the left. Bear Attack specializes in current and older Steiff limited editions. Bear Attack operates from two locations. One in Kronshagen which is in the north of Germany near Kiel and the other one is in Concord, California in the USA. If we do not have a certain item in stock, which you are looking for, send us an e-mail and we will try to locate it for you. We are an official retailer for Steiff Germany & Steiff North America Inc. .
Bear Attack accepts money orders, personal checks, bank transfers, American Express, Diners Club, Discover, JCB, Master and Visa Credit Cards, and payments with PayPal. If you have comments of any kind, please let us know. 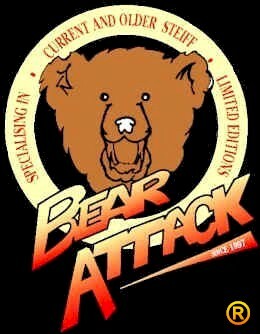 Bear Attack name and logo are registered trademarks. All the pictures of our merchandise are either owned by Bear Attack and/or Steiff. Copyrights exist on all pictures shown on this website. If you want to use in any kind of way any picture from this website, you must ask Bear Attack and/or Steiff for a written permission. Bear Attack is not aware that on any of the other pictures/icons used on this website, copyrights exist. If this nevertheless would be the case please inform Bear Attack immediately and the picture will be removed. Bear Attack believes that the contents of this website is in compliance with all applicable laws, would this not be the case please inform Bear Attack about the violations, and the appropriate changes will be made as quickly as possible.